Soda taxes disproportionately affect lower income Americans, according to a new study released by the Tax Foundation. Taxes levied per ounce on sugary drinks by Democrats in Berkeley, Philadelphia, and Seattle are even more regressive, according to the study. The middle class would pay the most if Congress passed a nationwide soda tax, as two-thirds of its revenue would come from those earning between $20,000 and $100,000. If an excise tax per fluid ounces were to be enacted, households earning less than $100,000 would pay 78 percent of the tax. "Sugar-sweetened beverage taxes theoretically offer the potential for reducing externality health-care costs stemming from excessive sugar consumption, and in this way they may raise the prospect of efficiency gains by signaling to consumers these higher social costs," according to the study. "However, these taxes also raise equity concerns to the extent these goods represent a disproportionate share of the consumption among lower-income households." The Tax Foundation analyzed household consumption data from Nielsen and found as income increases, soda consumption decreases. Those consuming the most soda, and therefore affected by soda taxes, fall into lower-income tax brackets. "Using taxes to encourage healthier eating choices is a fairly recent tax policy development at the subnational level," the Tax Foundation said. "Berkeley, California, voters passed a per-ounce tax on sugar-sweetened beverages in 2015 that has been followed by Philadelphia, San Francisco, Oakland, and Cook County (Illinois), though Cook County quickly repealed the tax after consumer backlash." "Assuming that at least some share of such taxes would be passed on to consumers in the form of higher prices, the analysis demonstrates that any form such a tax may take will be regressively distributed among the consumers," the Tax Foundation said. "Furthermore, the trends suggest that these expenditure profiles have become more regressive over recent years." Per-ounce taxes can be very costly to consumers. The 1.75 cents an ounce soda tax in Seattle increased the cost of a case of Dr. Pepper from $9.99 to $17.55 at Costco to public outcry. 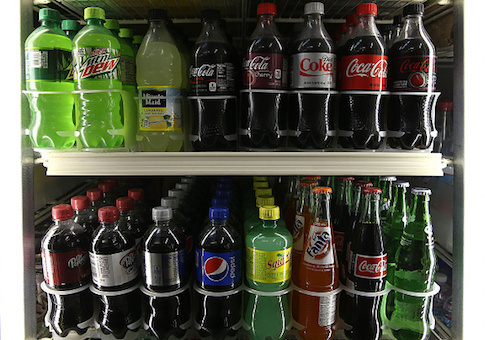 The 1.5 cent-per-ounce tax in Philadelphia makes soda more expensive than beer. Mark Mustio, a state Republican lawmaker in Pennsylvania, is attempting to repeal the controversial tax, saying, "Singling out one economic sector with an unfair tax that is 24 times higher than the tax on beer is, at best, nonsensical." Though a national soda tax is currently unlikely with a Republican-controlled Congress, if a tax was adopted in the future, it would target Middle America the most. "The Midwest features prominently in the highest levels of sugar-sweetened beverage expenditures with North and South Dakota, Indiana, Ohio, Kentucky, Tennessee, and West Virginia in the top set," the Tax Foundation said. "Joining the group is New Mexico and Nevada from the Southwest. From this group North Dakota leads in SSB [sugar-sweetened beverage] expenditures, averaging $232 in 2015, followed by New Mexico ($230) and Kentucky ($227). On the other extreme Montana spent only $151 per household on SSBs in 2015, followed by the District of Columbia ($163) and Idaho ($163)."